and, reducing the pipeline to prison. The prison industry approximates that 70% of children who are not proficient readers by the end of 3rd grade will go to prison. Broussard researches and finds the best program to grow resilient students. She selects Learning Together, a curriculum with 30-years of evidence-based research, which was created by educators at the University of North Carolina. Broussard creates BE THE DIFFERENCE™, an interactive program kicks off and wraps up every H.U.G. session reinforcing positive behavior and growing a culture to positively impact social change. Jefferson County Public Schools vets and approves the program. H.U.G. program launches at Lincoln Elementary School with 10 students in one school. H.U.G. granted 501-c-3 nonprofit designation and expands to Wilder and Dunn Elementary schools. H.U.G. 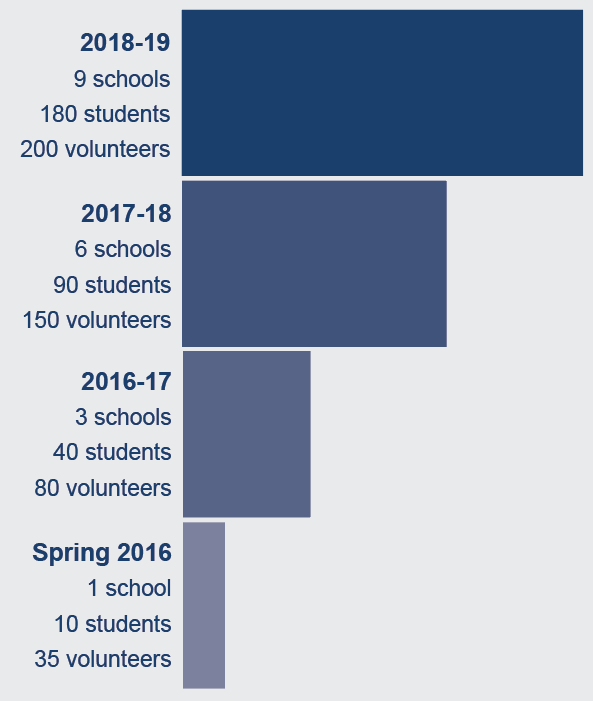 expands into Engelhard, Stopher, & Zachary Taylor Elementary School reaching130 students in six schools. H.U.G. Ambassadors Program established to continue to loop students back into H.U.G. during 4th and 5th grades. Students become role models and take a leadership role as the BE THE DIFFERENCE™ speaker.